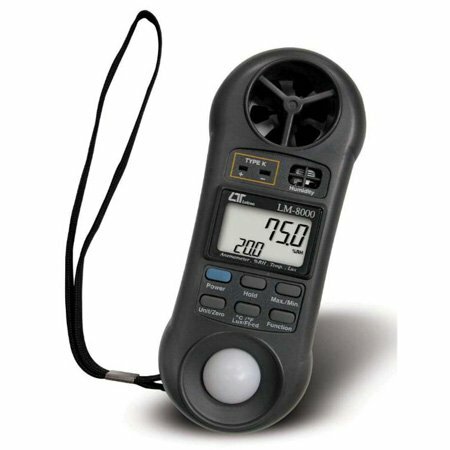 FEATURES * 4 in 1 professional measuring instrument: Anemometer, Hygrometer, Thermometer, and Light meter. * Tiny bone shape with lightweight and small size case design. * Low-friction ball vane wheels design provides high accuracy at high and low air velocity. * Exclusive photo diode and color correction filter light sensor, spectrum meets C.I.E. photopic. * High precision thin-film capacitance humidity sensor with fast response. * Standard type K (NiCr-NiAl) thermocouple outlet suitable for all kinds of type K probe. * Build in microprocessor circuit assures excellent performance and accuracy. * Maximum and minimum value. Zero button, Data hold. FEATURES * Tiny bone shape with lightweight and small size case design are suitable for handling with one hand. * Humidity : 10 %RH, to 95 %RH. Temperature : ℃,℉. * High precision thin-film capacitance humidity sensor with fast response to the humidity variety. * Microprocessor circuit assures excellent performance and accuracy. * Memorize the maximum and minimum value with recall. * Hold function to freeze the current reading value easily. * Hand cord design provides extra protection to the instrument especially for user one hand operation. FEATURES * Tiny bone shape with lightweight and small size case design are suitable for handling with one hand. * Hand cord design provides extra protection to the instrument especially for user one hand operation. * Exclusive photo diode and color correction filter light sensor, spectrum meets C.I.E. photopic. * Unit : Lux, Feet-candle. * 0 to 20,000 Lux, auto range. * Build in microprocessor circuit assures excellent performance and accuracy. * Concise and compact buttons arrangement, easy operation. * Memorize the maximum and minimum value with recall. * Zero adjustment. * Hold function to freeze the current reading value easily.